It’s good to have a couple of authentic Asian friends eager to take you out for “real” Asian food. Otherwise, you may just stick to eating pizza and cheeseburgers and miss opportunities to try real delicacies like, oh I don’t know...duck intestines or almost alive octopus. My taste buds are very open-minded. As such, I have had an array of culinary experiences that left me feeling from hey-I’m-surprised-that-was-actually-tasty, to ehhhh-that-wasn’t-good-but-edible, to that-was-so-gross-this-taste-will-be-in-my-mouth-forever. The surprisingly good include cow stomach with a tasty sesame sauce (牛肚). The edible but not good include spongy and sweet meatballs of mysterious origins, fish-flavored tofu, smoked pork fat, fermented soybeans (known as natto in Japanese) topped with raw egg, and salty dried plums. The gross include a big, black scorpion, salty egg moon cake, and pig intestines (no matter how long it’s cooked or smothered with sauce, pig intestines still tastes like an outhouse). One Saturday, I found myself sitting across from my young friend, Yanyan. Between me and Yanyan’s effulgent smile was a giant pot of boiling broth and an array of assorted raw edibles soon to be boiled and consumed: mushrooms, cabbage, spinach, frozen tofu, quail eggs, shrimp cake, sliced beef, noodles, and duck intestines. 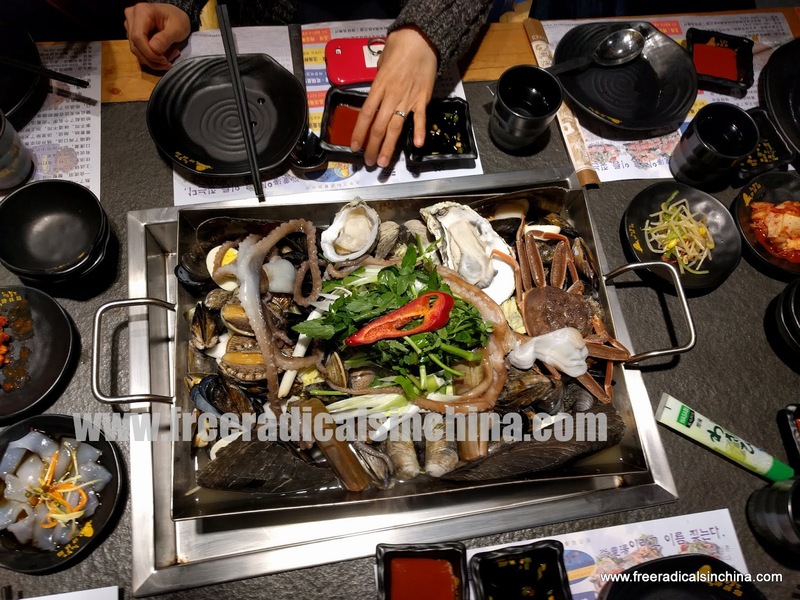 The pot was divided in half: one side bubbling with Sichuan style broth, a devilishly spicy concoction of pepper oil, peppercorns and tiny red peppers, and the other a simple, light broth fragrant with mushrooms and ginger. I recommend that Sichuan hot pot broth be coupled with a non-spicy partner. Those fiery peppercorns increase in spice intensity over the course of a meal. A non-spicy broth gives your mouth much-need breaks from the peppercorn burn. The duck intestines, long, thin, pink as cotton candy but shining slick and smooth, were neatly laid out on a bed of cabbage. I wondered if that plate of intestines came from one duck or several. Yanyan carefully dipped the duck intestines in and out of the spicy Sichuan broth. After a few minutes, the duck intestines cooked and soaked through with those deadly peppercorns, I dipped the duck guts into a bowl of sesame sauce and garlic and took my first bite ever of duck intestines. I chewed, masticated, gnawed, then chewed some more on the rubbery viscera. The verdict? If you don’t mind the tire-like texture and you have strong teeth and jaws, duck intestines is eatable. Unlike pig intestines, the duck variety has no strong feces flavor. A few weeks later, my Korean friends asked me if I liked seafood. Of course I do! So one drizzly Wednesday, a group of us convened for Korean style hot pot. The restaurant walls were lined with tanks full of-- you guessed it-- fresh seafood. The mollusks imprisoned in glass tanks contrasted with the splashy cartoons of jovial octopuses, squid and clams emblazoning the restaurants’ walls-- a grim reminder of a former carefree life at sea. Apparently, Koreans prefer their seafood really, really, really fresh, so fresh that the seafood comes to the table alive and writhing. Then the poor creatures either get cut into pieces with scissors to be consumed raw (and writhing) or suffer a slow death as they are brought to a boil before the diners’ eyes. The verdict on the raw (and still writhing) octopus: very fresh, like fresh sushi. The octopus was chewy with not much of a “sea” flavor. Now I wasn’t just giddy with the novelty of eating the still moving, but I actually thought that the hacked cephalopod (with sauce) was just plain good. So, what’s next in my food adventures? Who knows? I never imagined that saying yes to hum-drum lunch invitations would result in a duck gut or live octopus feast. My motto remains as is: Eat it. Don’t say no to food.